Claire’s is one of the world’s leading specialty retailers of fashionable accessories and jewelry at affordable prices for young women, teens, tweens and girls of all ages! Let Claire’s get the party started! 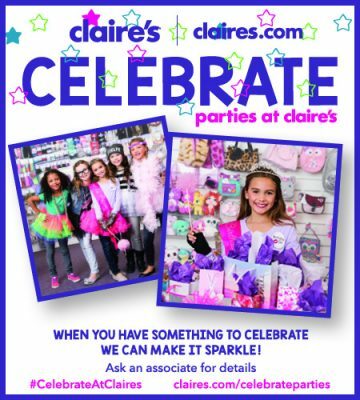 Celebrate your kid’s birthday in-store at Claire’s and they’ll help make your celebration an unforgettable experience! 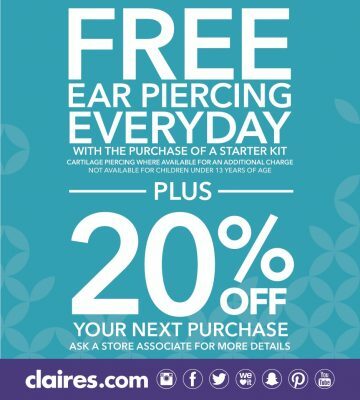 Claire’s offers FREE ear piercing every day plus an additional 20% off your next purchase!